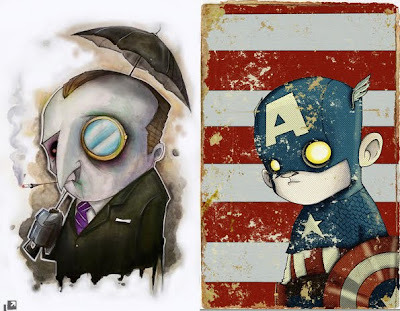 Describing his portfolio as a place where the monsters in his head get let out to play, Christopher uses mainly watercolour (with a few digital pieces here and there), to take a Tim Burton meets Humberto Ramos look at the people around him, his own 'monsters' and the heroes and villains of pop culture. To see how his lil' zombie-ish style handles the likes of everyone from Bobba Fet to Wonder Woman, visit Uminga's deviantART page or his own personal website at cuminga.com. I love that style of art. It looks like jumped out fresh from the pages of a Juxtapoz magazine. Thanks Jonny - I thought it was pretty stylised too! Love that Cap picture with the amazing weathering job. 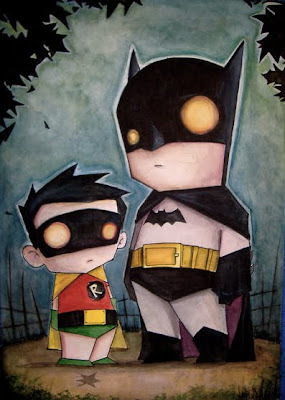 Yeah that's my fav too - I'm not a fan of 'cutsey' versions of heroes, but these Tim Burton-ish designs are really something else!